On November 15 2010 the Museum of the People’s Artist of the USSR Arkady Plastov opened its doors in Ulyanovsk. The exhibition tells about the painter’s life and achievements. More than 100 works reveal the process of formation and development of the painter’s artistic method. The verse of the great Russian poet of the 20th century can be seen as an epigraph to the destinies of the generation of Russians who grew up with and came of age together with the 20th century. For all the differences in their life stories, Boris Pasternak and Arkady Plastov were contemporaries in the deepest sense of the word: if for nothing else, they were connected by the fact that Leonid Pasternak - the poet’s father - taught Plastov at the Moscow School of Painting, Sculpture and Architecture. For the Russian intelligentsia “being alive” meant not only physical survival (although this too was important) but also “to live, feel, love and meditate and to discover” and, most importantly, to preserve oneself for creative activity, for the essence of the earthly calling of the poet and the artist. “Never betray your credo or pretend” is a command not to abandon your credo, to keep it in the most dramatic and tragic moments of the individual’s life, which is itself interwoven with the life of the nation and history. For Plastov the artist, this credo is the reflection of the meaning of a personality that has a visual import. An artist who never depicted hired models — those “pathetic models with wooden gestures and faces faceless as the bottom of a bucket” — and who always avoided stereotypical prettiness and strove for an expressiveness and distinctness of character in his portraits, he mostly painted old people whose faces bore the traces of what they had lived through, and the faces of children, themselves sprouts of hope with marks of a life ahead. Although the word “self-portrait” is applicable to the artist’s oeuvre in its entirety, in the master’s legacy self-portraits (in an ordinary, non-metaphorical sense) occupy a special place, one which is anchored in the rich tradition of world art — from Rembrandt’s self-portraits (from the artist’s youthful experiments to his tragic revelations late in life), to the self-portraits in the great compositions by Veronese, Velazquez and Goya, and the artistic experimentation distinguishing Vincent van Gogh’s self-portraits. Plastov created more than 30 selfportraits overall, with nearly half of them coming from the 1930s, a peak period of his artistic development. 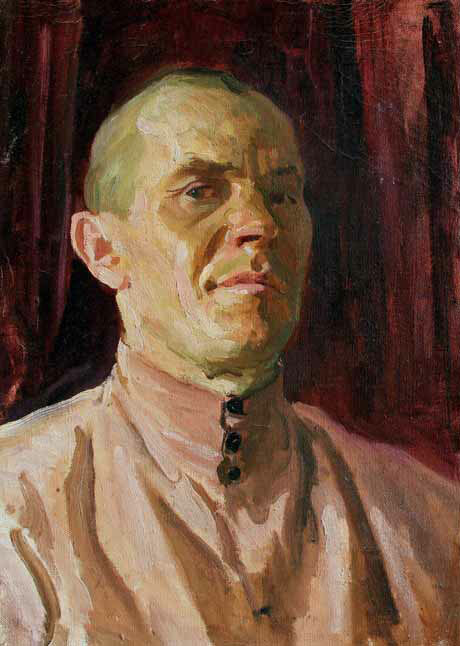 There are different stories behind these images: it appears that many were created without any specific narrative hook (unlike, for instance, the self-portraits of Pyotr Konchalovsky) — just a look in the mirror, with a desire to immediately realize this or that artistic idea, was sometimes enough to drive the artist to activity. Some self-portraits indicate an eagerness to look at oneself as an artist does at a model: to scrutinize oneself, to learn something about the self. Nevertheless, the self-portrait was for Plastov above all a visual exploration, a chance to freely experiment with a model which, in this case, was completely under his control. Later Plastov would write to his 14-year-old son Nikolai: “I received your letter with the self-portrait. I like the drawing very much. The only thing I would suggest is to highlight more sharply the form, the volume... Just look at the pictures of Holbein, or Serov, or Repin, and it all will become clearer to you. It’s good that you copy Hals. Try copying Velasquez using one paint, from the photograph that I brought you. Apply a brown paint.” (here and below all references to the correspondence are to the original letters from the Arkady Plastov’s family archive — TP.) The “Self-portrait in a Hat”, created in the late 1910s — early 1920s3, was gifted to Dmitry Arkhangelsky. 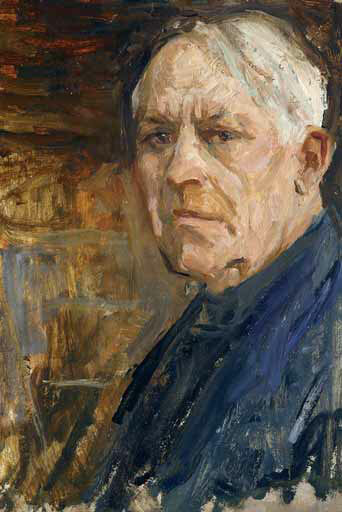 The piece demonstrates Plastov’s concentration on volume, with an express, almost exaggerated focus on form-generating elements of both the face and the background. Combining the traditional classical-style approaches (Caravaggio, Georges de La Tour) with more recent discoveries, he came up with an unusual image. The lighting in the style of Caravaggio, the lines of a dandyish hat above the head, and a certain conventionality of the complexion come together to produce the impression of a game, a role the young artist has assumed, perhaps guided by the realization that he is using a painting style that is novel for him. The interest among Russian artists in French painters, most of all Cezanne, apparently can be traced in their resolution to shift emphasis to the pictorial core of images, bringing out in objects their structure — a framework of shapes and planes (including colour planes). Other artists working in this vein included Alexander Shevchenko, Alexander Kuprin, Nathan Altman, and Boris Grigoriev. 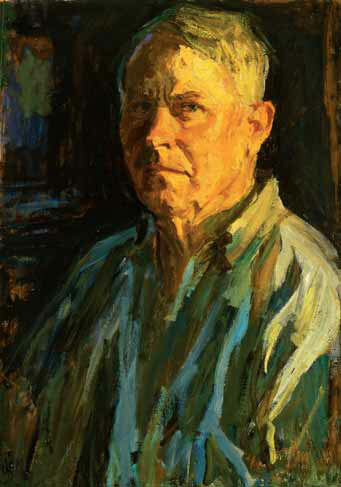 In the self-portraits that followed, the artist remained interested in conventional lighting and a predetermined colour scheme. When he came to Moscow in 1917 to finish his study at the School, the young Plastov “was surprised to walk into barricades and gun shots on the streets”. “It ultimately sank in on me,” he remembered later, “that revolution in a country such as Russia then was a process which, in terms of its size and importance, was akin to a transition from one geological period to another on our planet”4. For eight years in a row the artist lived in Prislonikha without leaving it, “plowing, mowing, harvesting.”, and as the village’s most literate person he was elected to a Poor Peasants Committee (the Kombed) and a Famine Relief Organization (the Pomgol). His ties with Moscow were broken, and his fate took him far away from his true calling as an artist over these years. 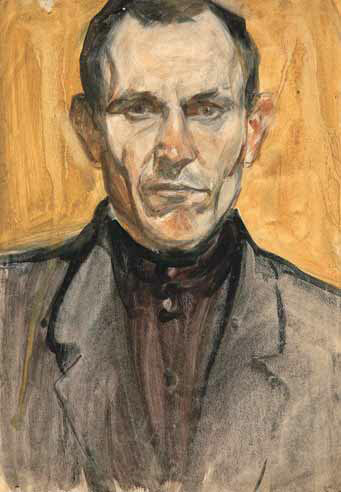 The self-portrait on carton made in the first half of the 1920s undoubtedly had a special meaning for the artist; before a fire in 1931, it had hung in his home in Prislonikha. This portrait is an attempt to look into oneself and to answer some painful questions. The look in the eyes is open, ingenuous — there is even something pleading in it. Long in the making, the piece is loaded with artistic references to Rembrandt and bespeaks an obvious resolution to address artistic challenges gradually and competently, yet without a freedom of perfect knowledge. A dark, nearly monochrome black background is contrasted with the face, with a classic light-toned highlight on the collar (obviously borrowed from the old masters’ portraits) producing a visual tenseness, a certain anxiety, which, it seems, echoed the artist’s frame of mind. If we follow the theories of Nikolai Gogol or Oscar Wilde, the artist left a part of his soul in this portrait. In 1925, quitting all his “secretarial functions” and having made some money from commissioned paintings and sculptures in Ulyanovsk, he moved to Moscow — the city for which he had long had “an overpowering yearning”. His strength continued to be tested: “For a whole ten years I was barely making ends meet as a poster artist in Moscow in winter, and in summer — as a grain farmer in Prislonikha until, finally, I became a free painter”.6 But the work on posters, along with simultaneous initial forays into graphics (in the 1920s Plastov worked for the Mirimanov publishing house and “Znanie” publishers, illustrating the works of Anton Chekhov, Maxim Gorky, and Gleb Uspensky), brought out in him the capability of a universal visual artist with versatile faculties. The decade of the 1930s were marked by significant changes in Plastov’s life. In February 1932 for the first time he was offered a commission in Moscow — to contribute to the creation of large-sized paintings themed around haymaking and animal husbandry. “Just think of it, Nalya: painting over a vast area the images of haymaking and animals, peasants — men and women, horses, the glistening noon sky, the swelter and haze of the magic days of summer. That was more than my poor heart could take in. I was hurrying up along a street nearly weeping with joy. Just think. after the hated, measly posters, after those themes bricked up in the deadly cement of conventions and measly techniques, suddenly — painting in the full sense of the word, such a training ground for me I could only dream about as one dreams about castles in the air..” (Arkady Plastov to his wife Natalya Plastova, February-March 1932) Almost all of the self-portraits created in the 1930s (more than 17 in all) are marked by artistic experimentation, and show that his distinctive artistic vocabulary was developing. For all their diversity and lack of resemblance to one another (sometimes they appear to represent not one and the same, but different persons), these portraits share certain common artistic techniques and patterns reflecting the artist’s creative quest. First of all, this includes (as in the 1920s) a combination of different traditions and styles of portraiture — now mostly Western European, both old and more recent. Secondly, there is a wilful limitation of the basic colour scheme, with only three or four — five at the most — paints used. And lastly, there is a certain consistency in the progress from a warm and vibrant (sienna, umber) undercoat to cold form-generating strokes, from an internal abstract invariable to real plein air imagery (reflexes, transparent shadows), with numerous highlights like a light spot on a hand, a book, or a white collar. It was a combination of the techniques and patterns of the “old” portrait (Caravaggio, Jose de Ribera, Georges de La Tour, Velasquez, Hals, Rembrandt) with the discoveries of the Impressionists. 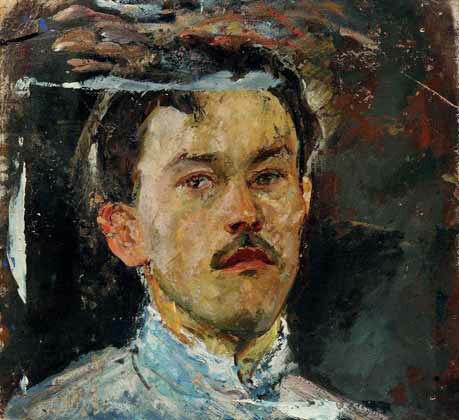 For Plastov, his self-portraits were a testing ground where techniques and methods of painting were born that would be later applied in other works. In the selfportraits the artist demonstrated the mastery of form and sculptural skills he had honed in his youth.8 It was in the 1930s that Plastov progressed from his study of painting techniques towards an excellent command of the brush. 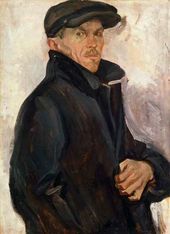 More than 17 portraits from the 1930s demonstrate two trends, two sorts of imagery that Plastov was trying to master: firstly, a continuation of the tendencies marking the “Self-portrait in a Hat”, with its sharp borders between light and dark and discontinuities between forms, and secondly, a pictorial pattern in which strokes with no clear borders between them create a vibrant pictorial texture. 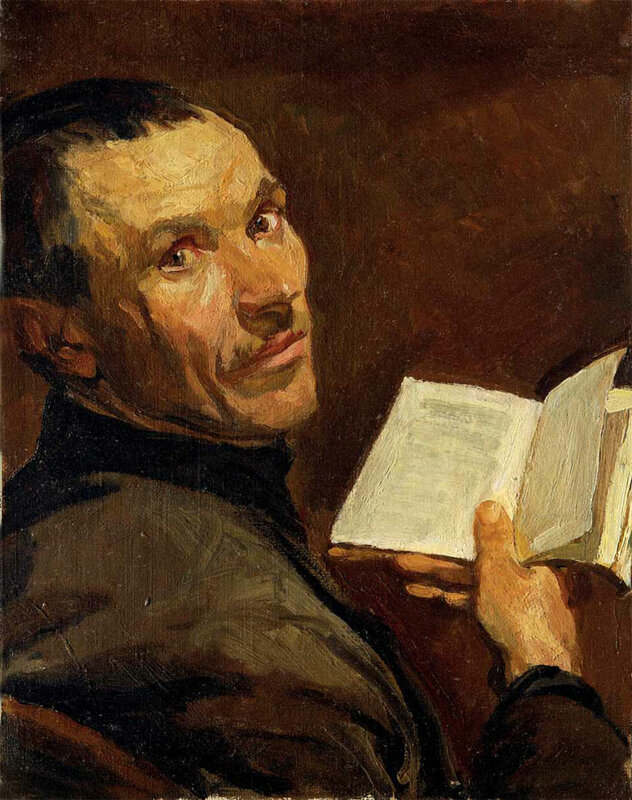 It can be said that the “Self-portrait with a Book” (1930s) is a sort of statement on loyalty to the old masters (a loyalty very archaic and outdated in the first decades of Bolshevik rule). An original angle, conventional lighting, a book with rustling parchment sheets — all this evokes the portraits of Velasquez, Rembrandt or Francisco de Zurbaran. The artist appears to be keen on immersing himself in long gone eras, or looking like a man of the past. For all the visual asceticism — only five or six colours are used (dark lake, ochres, ivory, burnt sienna) — the portrait is stunning for its visual force, with the gradations of tones carefully crafted. 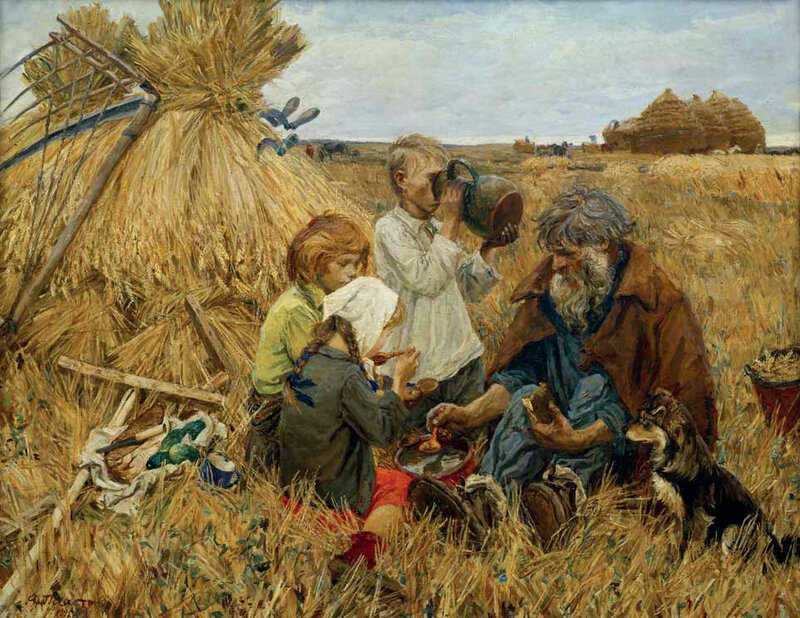 Plastov the sculptor highlighted to advantage the border between light and dark in forms, with each individual brushstroke by itself having a visual importance. As in the “Self-portrait in a Hat”, sharply distinguishable planes form the backbone of this piece. 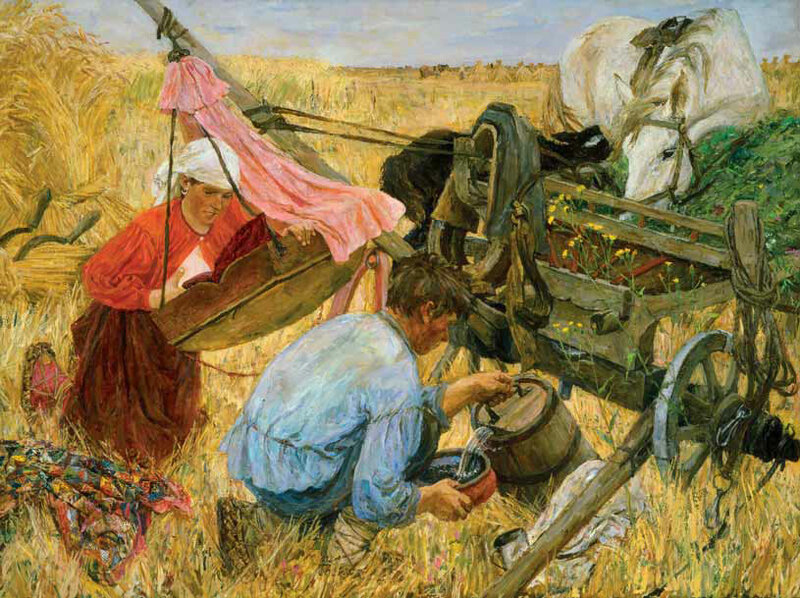 This composition can be regarded as the first in a whole series of peasants’ portraits that Plastov created in the 1930s using the same technique (“Fyodor Tonshin”, “Nikolai Stepanovich Sharymov (Nazarov)”, and others). The artistic ease that distinguishes this portrait matches that found in images by Hals. In the mid-1930s the artist created a self-portrait demonstrating his transition to a new visual repertoire — the brushstroke no longer has clear boundaries and the shadowed part of the face nearly blends into the background, the two forming a single, harmonious texture of the image. 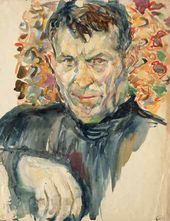 On a small rectangular canvas (apparently randomly chosen from what was at hand at the time), the close-up of the face in Plastov’s characteristic, favourite angle — halfturned to the viewer — is one of the artist’s best visual experiments. This new technique is marked by brisk firm movements of the brush over form-generating areas of undercoat of liquefied paint already slightly dried. The effect of the clear, antique contours of the face is achieved not through a sharp, pronounced geometry of the planes but through elaborate blending of the brushstrokes, barely perceptible within the limits, which produces a vibrant fabric resembling Titian’s late works. Now Plastov achieved a perfection of workmanship in which the movement of the thought and the movement of the brush were synchronised. 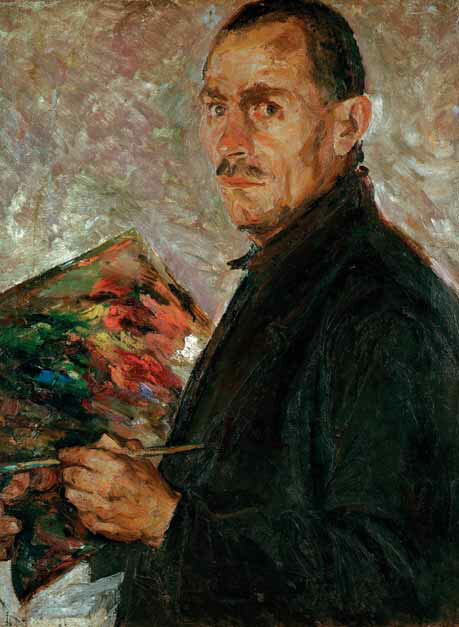 By that time Plastov had created several portraits featuring a palette, a brush and frames — images of the artist at work: “Self-portrait” (1934-1936, Tretyakov Gallery), “Self-portrait with a Palette” (1930s), “Self-portrait in a Black Jacket” (late 1930s), “Self-portrait against a Carpet” (1930s), and “Self-portrait with a Brush” (1938-1940, all in the Plastovs’ collection). These portraits demonstrate the same technique that Plastov finally mastered — that of brisk, shimmering brushstrokes. The self-portrait held at the Tretyakov Gallery is one of the most interesting paintings Plastov produced in this period. The artist penetrates the pictorial space with his image: the plane of the painting, of a more or less similar colour tone throughout, unifies the face and the background, and only such highlights as the dark pyramid of the clothes lend stability to the portrait. An impressionist, subdued colour design (earth pigments were used), and a special arrangement of pictorial elements creates the effect of a vibrant harmony of life and a binary perspective when the planes seem to be switching places in front of the viewer’s eyes. The joy of pure colour on the palette stands out. The “Self-portrait in a Black Jacket” features a similar low-key but seemingly vibrant visual texture, implying a similar joyful opportunity to create a colour scheme with pure, clear colours fitting in with the overall design. A palette and an empty frame on the wall seem to be more than just accents in the melting space or details of the interior — they indicate the unrivaled surge of creativity, the inner freedom, the awareness of one’s control over the elementary forces of painting, and of an infiniteness of ideas and goals that the artist experienced in the mid-1930s. Plastov’s artistic career was on the ascent. One evening in the autumn of 1935 he presented for the first time his works “Fleecing Sheep” (Chelyabinsk Picture Gallery), “Haymaking”, “Horse Stables at a Collective Farm” (Private collection, UK) at a meeting of the artistic council of the Russian National Union of Visual Artists Cooperatives (Vsekokhudozhnik). The artist experienced at that time contradictory emotions: “I didn’t know where to hide myself with my poor pictures. I had a feeling that whoever saw them would raise their lip in contempt. And I felt great pity for everything, but everything that was related to these pictures and that was now laying naked under the eyes of what I thought then was a strange, indifferent and, moreover, hostile crowd.” (Arkady Plastov to Natalia Plastova, October 26 1935). “I believe,” the artist wrote in 1935, “that my life is heading to a point similar to springtime by a dam. Upon a taut and mighty ridge of the external stream, the lusterless rags of ice are splitting. From now on, no one will dare to befoul with his soiled foot the elementary force swollen with strength and alive with freedom. This force noiselessly and sternly advances to the barriers. The locks are being lifted hurriedly and obligingly, and there is a rumble, a roar, a flickering, and a foam with a mad, gigantic force which is suddenly vented into space. Now I feel inside myself especially strongly the fermenting of this wild elementary force and the urge to physically express it in some way. With vehement techniques, with a narrative showing the human body in all its frenzy, in a state of extreme strain and verity. I have a vision of forms and paints saturated with passion and rage, roaring and howling at the top of their voices near all that sugary niceness.”11 “Harvest Feast” (the original author’s title was “Feast at a Collective Farm”), “Bathing of the Horses” (both in the Russian Museum), and “A Flock” were created between 1935 and 1940. Plastov’s famous self-portrait (19351936, the Plastovs’ collection) in a black overcoat and a cap features the artist as a regular townsman, hurrying somewhere, caught up in the bustle of a big city. The experience of living in the village of Nemchinovka, where he rented a room in a poorly heated shack, and commuting daily on a train carrying food and kerosene for his stove brought the artist in direct contact with the life of working Muscovites. The 1930s series of self-portraits includes a watercolour piece (1939-1940, collection of the artist’s family) marked by a different mood, which stands apart from the general trajectory of the artist’s explorations. The work, like the others, was created in Nemchinovka or Moscow. The artist imaged himself facing forward against an ochreous background, in a tightly buttoned dark shirt and a dark jacket. The masterfully-painted face surprises the viewer with its rigid, tense expression. The portrait resembles a photograph from an official document, maybe even from a police file (only the profile side of the photograph is missing). He looks like a person of his time — wary, as if anxious that something bad is bound to happen at any minute; this self-portrait is a remembrance of the time in which it was made. 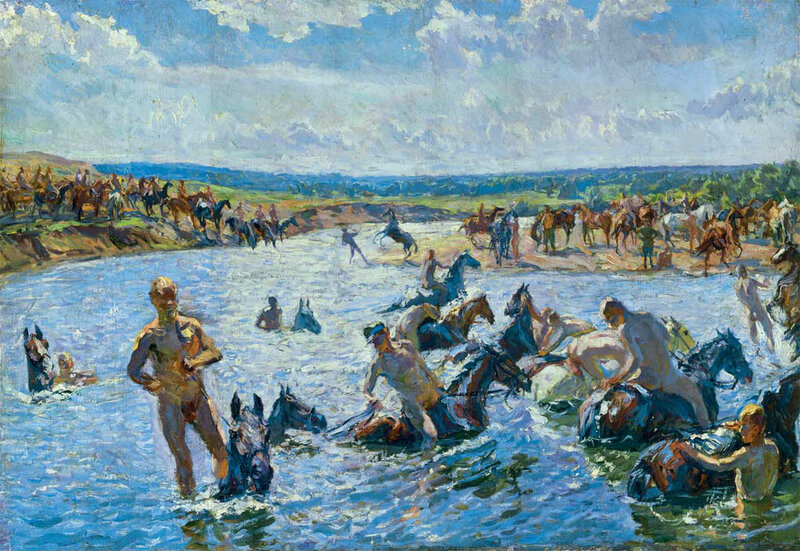 Now ranked among the nation’s best painters, Plastov keenly felt the suffocating atmosphere of unfreedom and fear — an inevitable attribute of even relative closeness to public life in Moscow. 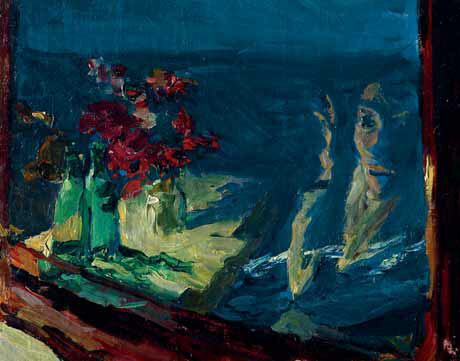 In the Spring of 1941, on his way back home from Tbilisi (a journey that yielded a series of first-rate sketches — the world of the Caucasus region had captivated him, as it did many other Russian artists), Plastov made a remarkable selfportrait on a train — a reflection in the blue nocturnal window of the train. The challenging quest for an individual vocabulary in self-portraits seemed to be coming to an end. 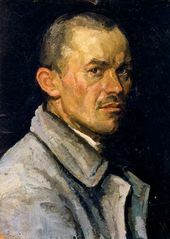 The 1940s and 1950s self-portraits are calm and balanced, and from now on, all of the artist’s vigour and temperament would be channeled into paintings — in the tragic war-themed pieces such as “The Germans Are Coming” (1941, Tula Museum of Fine Arts), “Defending the Homeland” (1942, not found),“The Fascist Plane Flew By” (1942, Tretyakov Gallery) , as well as cheerful, victorious paintings such as “Harvesting”, “Haymaking” (both 1945, Tretyakov Gallery) and peaceful, life-loving pieces such as “Tractor-drivers Dining” (1951, Irkutsk Regional Fine Art Museum; 1963 — copy made by Plastov, Tretyakov Gallery), “Spring” (1954), “Summer” (1959-1960, both in the Tretyakov Gallery), “Noon” (1961, Russian Museum), “Wellhead” (1952, National Picture Gallery of Armenia, Yerevan). Plastov’s self-portraits of the late period — there are three in all — are stunning: “Self-portrait” (1969-1971), “Selfportrait” (1971) and the last self-portrait, from April 1972, one month before his death (all in the collection of the artist’s family). The traces of a life lived decently and righteously, which he valued so much in the expressions of his models, the traces of transports of delight, love, and a reverence for life stamped his face and entire appearance with marks of nobility and dignity. The “Self-portrait in the Light of a Setting Sun” (1969-1971, collection of the artist’s family) was created at the same time as a painting titled “A Fragment of the Past” (1969-1970, Tretyakov Gallery), in which the artist drew on his childhood memories and unfulfilled dreams about a just universe. The picture became for him an internal reckoning, a prayer, a farewell. Its rich colour scheme echoes the selfportrait’s visuals. And the light of the setting sun appears as the evening light of a life that is now spent. “Perhaps until old age I’ll continue, as in the days of youth, to recognize and feel excitement over the sweet-smelling breath of art, no matter what or who carries it. And as soon as my soul feels this delicate, balmy waft of the beautiful, by God, I am no longer myself, I become impetuous as if I’m 17, and my entire life is ahead of me and very soon I’ll see the Tretyakov Gallery, Moscow, St. Basil’s Cathedral — all of Rus’, dear, great and unconquerable.”15. Plastov, Arkady. Autobiography. The Plastovs' archive. Kiselev, Viktor. A memoir. The Kiselevs' archive. Here and elsewhere fragments of the letters have been reprinted from original letters in Plastov's archive The 1935 “Haymaking" was lost, its whereabouts now unknown; the 1945 version of “Haymaking" is held at the Tretyakov Gallery. “After spending some time studying sculpture at the Stroganov School, I decided it would be worthwhile to study it along with painting, to get a good conceptual grasp of form". Plastov, Arkady. Autobiography. The Plastovs' archive. Plastov, Nikolai Arkadievich. Reminiscences About My Father. The Plastovs' archive. Kostin, Vladimir. Among Painters. Moscow. 1986. P. 38. Plastov, Arkady. Leningrad. 1979. P. 9. Plastov, Arkady. Autobiography. The Plastovsʼ archive. Plastov, Nikolai Arkadievich. Reminiscences About My Father. The Plastovsʼ archive. Plastov, Arkady. Paintings. Moscow. 1986. P. 21.